Hollybeary Creations : January Release Day 4 with NND. January Release Day 4 with NND. 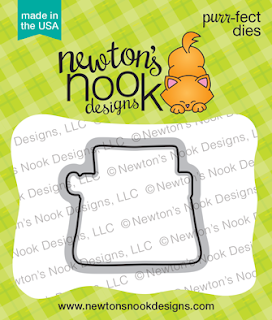 It's the final day of the January Release with Newton's Nook Designs... All of the new products will be available tomorrow in the store. 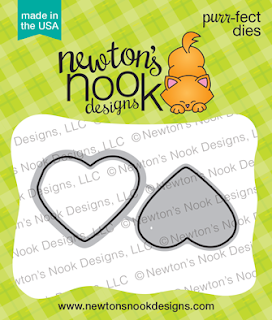 Today we are sharing... My Type and Candy Heart and their coordinating dies. 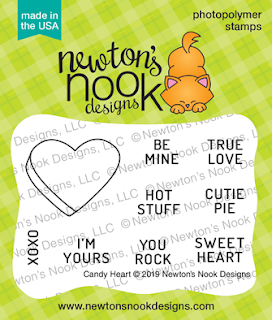 The Candy Heart Die has a unique edge to it that lets you get that drop shadow effect with the die that you see on the stamp. I created a Background with some Fun pattern papers from my stash for the My Type card and just colored the image in with Copics. I wanted to Typewriter to be the star of the show. This makes a great card for just saying Hello. My second card features Candy Hearts... I created a background with some embossing paste and the Tumbling Hearts stencil. Then I die cut both pieces of the heart from some watercolor paper and added Distress Inks for the color. I made the shadow darker and then I used Distress Oxide ink to stamp the words on each heart. Gorgeous cards!!! Both the background are really cool!!! I need to be more brave and try paste too! Love that card! love this! your backgrounds are great!!! I love the typewriter! So much fun! great job with the candy hearts too! 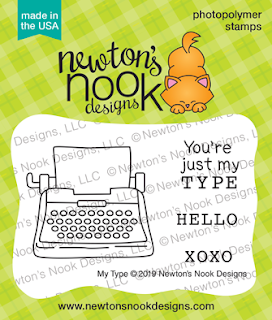 Your fishtail tag is perfect to make the typewriter stand out and I love the drop shadow effect on the hearts! I love the colorfulness of the typewriter and it's background! I also love the background added to the hearts card. Both cards are adorable! I love the backgrounds on both your cards! I'm in love with all of the new ideas! Adorable cards! 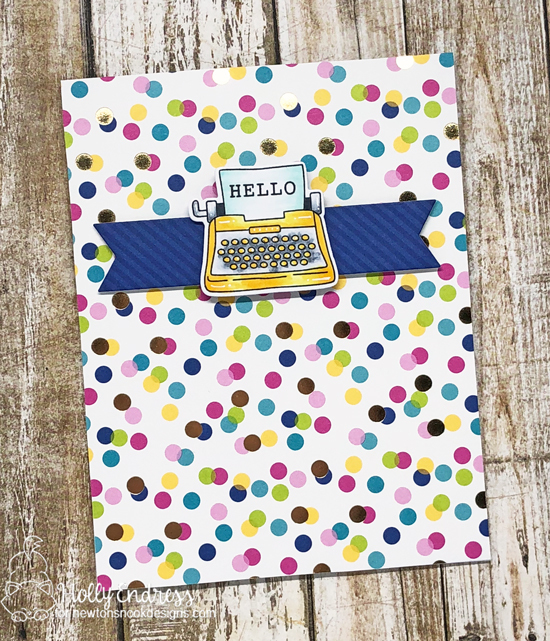 I love the simplicity of the typewriter card with the fun background paper. And the candy hearts are so lovely over that background! Really adorable cards! Love the way you used different colors on the first Valentines Card & the tonal heart background really makes those cute candy hearts pop! Fun cards; adorable. Love these cute new sets. adorable images and I like your choice of patterned paper for the typewriter card. these cards are so nice! So cute. I like the polka dot background on the first and the colorful hearts and textured background on the second. Super cute cards! Love the typewriter and the fun candy hearts! Great cards! Cute cards using these stamps. great designs for both cards! Beautiful cards! Love the subtle heart background with the embossing paste! I love your cards. I really like the conversation hearts! I love the backgrounds you used on both cards! So pretty! 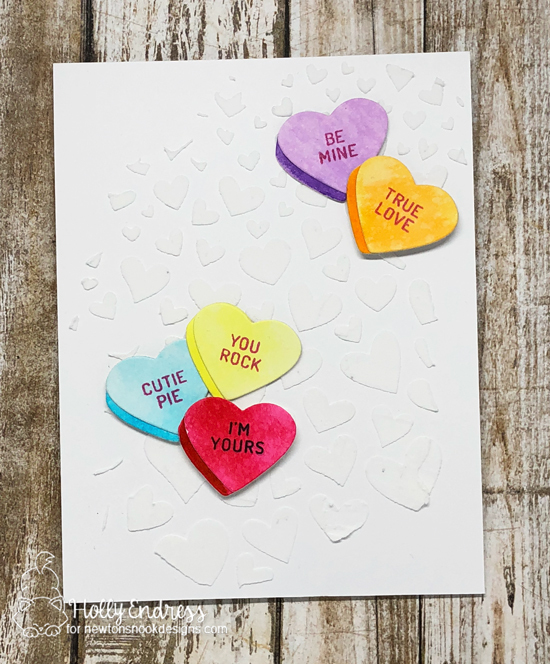 The Candy Hearts card is perfect for Valentine's Day, and the other is a great "anytime" card. Both designs are a great way to use these new release items! Thanks for the good ideas! Adorable cards. I like what you did with the background for the hearts and the typewriter stamp is just so cute.